U2 certainly know how to put on a tremendous show. And they certainly know how to campaign for debt relief, AIDS treatment, rebuilding New Orleans and other pressing issues of the day. But they've never said too much about carbon footprints. Arguably, because their tours can be astoundingly damaging to the environment. Apparently, the current U2 360 tour will have a carbon footprint equivalent to that of 6500 average UK residents all put together over an entire year. Or 65,000 Tonnes of CO2. It uses enough fuel to fly to Mars. And back, given 2010's tour dates. "The carbon footprint generated by U2's 44 concerts this year is equal to carbon created by the four band members travelling the 34.125 million miles from Earth to Mars in a passenger plane. You also have to add the carbon emissions from the same number of concerts again next year. "Just looking at the 44 concerts this year, the band will create enough carbon to fly all 90,000 people attending one of their Wembley concerts to Dublin. To offset this year's carbon emissions, U2 would need to plant 20,118 trees." That's a lot of digging. We hope U2's spades have a sharp edge. Carbon footprints have become an issue for global-touring bands in recent years. Consider the contrast between U2 and Radiohead. For their 2003 ampitheatre tour and 2006 theatre tour, Radiohead commissioned Best Foot Forward (an ecological consultation group) to audit the trips' environmental impact. While much of any tour's carbon footprint is left by attending fans, Radiohead's carbon footprint for the 2006 tour was just 2295 Tonnes of CO2 (compared to U2 360's 65,000 Tonnes). Radiohead have since been trying to reduce environmental impact further. For their 2008 tour, they set themselves a target of "no air freight" (they travelled with gear from the UK to the US by ship) and tried to hire backline and lighting locally. It didn't always work, but the total air freight was reduced to less than 1000Kg. U2's 360 tour and Radiohead's are certainly not comparable in size (or audience served) but it's a stark comparison. And what of U2 360? Carbonfootprint.com don't speculate on the total air freight weight, but the three stages for the U2 360 tour require 120 trucks in transport. Yes, the U2 360 'claw' stage is so vast, there are three of them. One in situ, while a previous gig's stage is being dismantled, and the next venue's stage is being flown and built. Of course, Carbonfootprint.com's analysis paints U2 as bad, but it is not the whole story. U2 are purchasing carbon offsets to help repair the cost. Additionally approximately €9 million in U2 360 tour profits has been pledged to charity. And of course, the U2 360 tour will provide a huge financial boost to both local economies and U2 360 contractors in tough times. But when The Edge is used to taking 45 guitars on tour, and Bono has been known to fly a hat in a first class seat, the band are surely aware they have more work to do on their eco-image. Face it, if U2 put on a stadium show - just them, their songs, regular lights - they'd sell-out anyway. 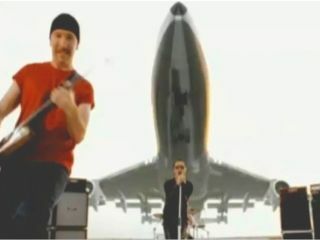 U2 may be named after a plane, but perhaps U2 need to love planes less?